It's been quite some time since a giveaway, isn't it? Giveaways on Chamber of Beauty are always equivalent to a major thanks from my side- your support has led me to where I stand now! Getting to the point, I'm here with a giveaway sponsored by Walktrendy.com, a beautiful online fashion store! The moment I browsed through this site, I fell in love with it due to a number of reasons. Firstly, they have a remarkable collection of dresses, skirts, tops and accessories. Secondly, everything is very reasonably priced, lying somewhere between $20-$40 on an average, isn't that cool? And thirdly, even at such a reasonable price, they offer free shipping worldwide!! So that sums up why I'm a big fan of this store! 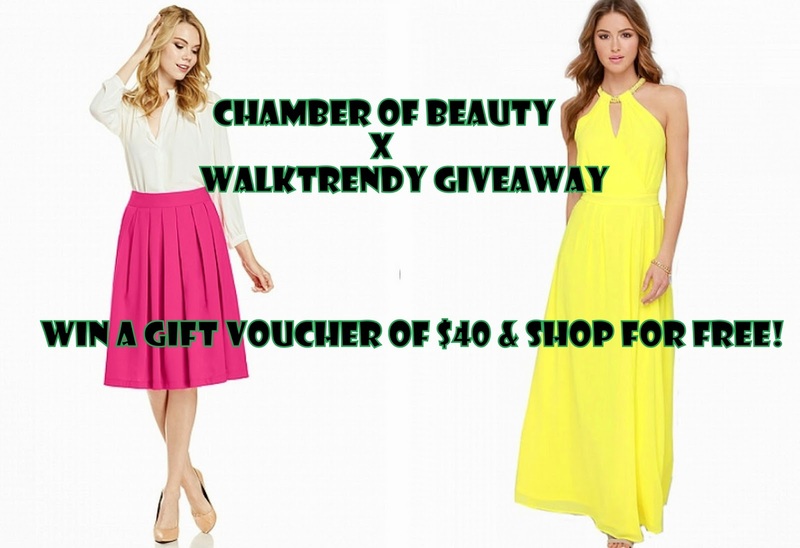 You can be the next member of this fanclub by entering this giveaway for a chance to win $40 gift voucher to shop for free at Walktrendy! Comment with your email address and you are done! Giveaway ends on 29th of May and is open INTERNATIONALLY!